Being built in Bath, Maine, and programmed by the Waltham-based Raytheon, the newly christened Zumwalt is the world’s most expensive killing machine afloat. 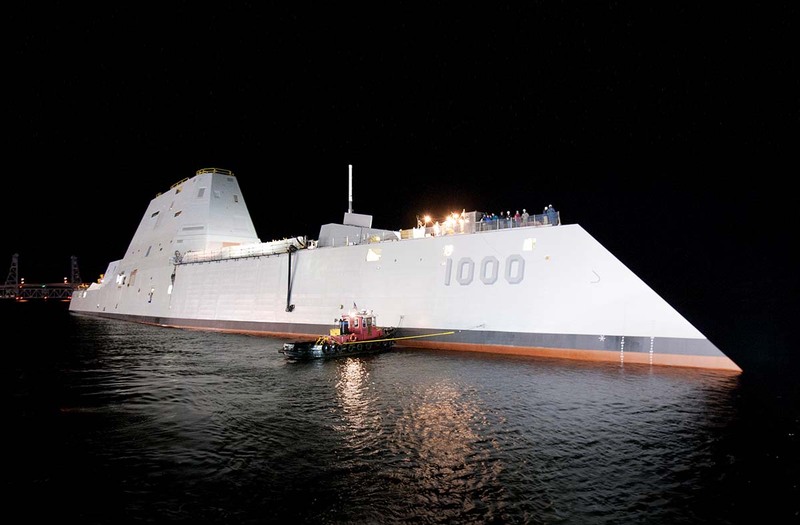 The Weight: Nine hundred of the Zumwalt’s 15,000 tons come from the composite deckhouse, which was constructed in ­Mississippi, barged up to Maine, and welded to the hull. The Power: Gas turbines generate all onboard electricity and propulsion, plus enough power for futuristic electromagnetic weapons. The Controls: Raytheon created a single computing network, housed in the ship’s mission center, which controls all onboard functions and is operable from anywhere on the ship. The Design: The inward slant of the hull creates a minimal cross section, so radar reads the behemoth as a small fishing boat. The Weapons: Two 155-millimeter guns on deck are capable of launching long-range missiles that reach a target up to 63 nautical miles away, or about the distance from Boston to Hyannis. The Size: As the Navy’s largest destroyer, the Zumwalt measures 610 feet from bow to stern—more than three times the length of the USS Constitution. The Namesake: The name USS Zumwalt graces the ship’s transom, honoring Admiral Elmo R. Zumwalt, the youngest admiral to serve as chief of naval operations and a crusader against race and gender discrimination in the military. The Crew: Only 158 sailors are needed to crew the Zumwalt—about half the number needed for older destroyers.